...with the suggestion above that this is the cerambycid, Brachysomida bivittata. Moved from Three-lined Potato Beetle. - elytra with fine, irregular punctures and pubescence. I´m moving it to family level Chrysomelidae, not being sure if it might even be a longhorn. the Cerambycid, Brachysomida bivittata? Yanega plate 3 says the species is very variable and shows one with black spots on an orange pronotum and striped elytra, fig 31a. 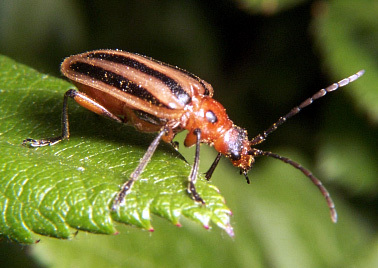 In the guide we have Tom's with stripes and with black spots on the orange pronotum. We left a note there for Frank who identified those. Other images of the variablity here. The shape of the elytra is so different! Almost triangular in B. bivittata, parallel in the insect in question. I don't know anything about these beetles but this is very unconvincing. To me it has the looks of Chrysomelidae.